Yale Acres is located in a residential neighborhood setting on Broadvale Road, Broadvale Court, Gilbert Road, Elizabeth Road and Elizabeth Court. The property includes 47 multi-unit buildings totaling 162 units. The apartments are individually heated with oil tanks. Yale Acres is located within a half mile of public transportation. 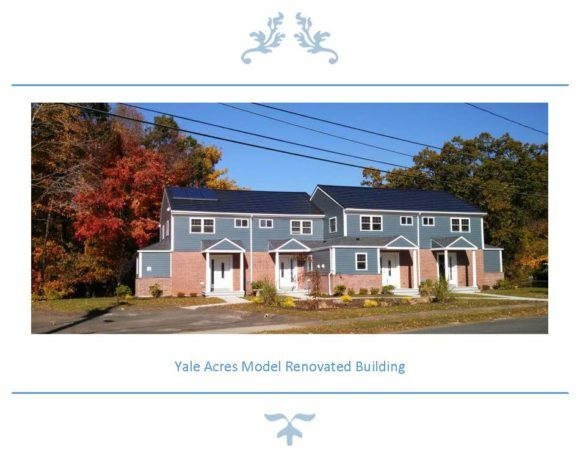 Yale Acres is earmarked for modernization and renovation in 2018. The proposed redevelopment of Yale Acres is the in-place rehabilitation of the project. The rehabilitation will include new exteriors (siding and roofs), new interior finishes including repairing and resurfacing hardwood floors, new kitchens including new cabinetry, countertops with new Energy-Star rated kitchen appliances, new bathroom vanities and fixtures, electrical devices, and wall/ceiling finishes. Significant improvements also include proposed energy efficiency, conservation measures and renewable energy technologies. These improvements include new insulated windows, wall insulation, lighting fixtures, LED outdoor lighting, and high efficiency mechanical systems including geothermal heating, cooling systems and domestic hot water systems with solar thermal supplementing the geothermal system, and solar PV systems. An Energy-Star Model Building was completed in 2013 which provides for 70% energy savings. Evette Nava is the Asset Manager and can be reached at (203) 235-0157 ext. 7600.